How to Get HVAC Contractors License: A heating, ventilation and air conditioning (HVAC) license is required by individuals who install, repair or maintain heating and cooling systems in residential or commercial constructions. This is especially true of projects that exceed $500. It will also be a requirement for people who sell service contracts to new and existing clients. There are several factors you will need to ensure to get the HVAC contractors license Proper educational requirements will have to be fulfilled. A prospective HVAC technician must successfully finish high school or receive a GED. During this time, they should ideally take classes in industrial arts, math, electronics, physics and mechanical drawing. After completing school, the candidate may join an accredited HVAC training program. These training programs offer a curriculum based on studying the principles of HVAC installation and repair along with subjects such as blueprint reading, equipment design and temperature control. These programs may take six months to two years to complete. The apprenticeship program may last anywhere from 3-5 years. Formal programs might allow candidates to combine their theoretical and practical learning practices. During an apprenticeship program, the prospective HVAC technician would shadow a licensed HVAC technician and simultaneously receive classroom training as well. These programs are offered by professional unions. Once you are finished with your apprenticeship program, the next step would be taking the actual HVAC License Exam. 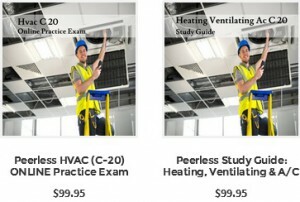 These exams test a prospective HVAC technician’s ability to exhibit a satisfactory knowledge of the various aspects of HVAC installation and repair. In addition to that, some exams might also test the applicant’s knowledge of electrical codes. Bear in mind that HVAC technicians who intend to work with refrigerants are also required to acquire an additional certification. For this, they must pass a second written examination that focuses on the relevant subject matter Hvac Study Guide can be helpful for such exams. What Topics to Prepare For the Exam? This is a general overview of the subject areas you might be questioned on. Be sure to check the detailed topics covered, as guided by the official State Boards.